This is a yummy fresh salad that I’ve been having for lunch lately, as I had been given a huge bag of brown rice to use up. And who doesn’t love sushi! This is a play on the California Roll, minus the surimi. You get all the sushi flavor, in a simpler form! I’ve just been doing a vegetarian version, but of course add whatever sashimi you’d like! 1.) Mix the dressing. Stir together the wasabi powder with the boiling water until a paste forms (if using less wasabi paste, use less boiling water; if using more wasabi paste, use more boiling water). 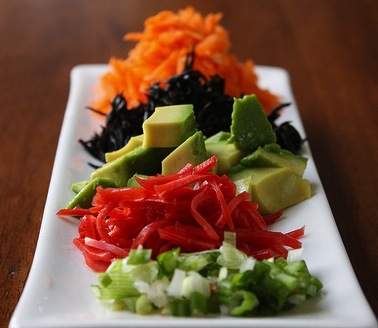 Whisk other dressing ingredients into the wasabi paste. Set aside. 2.) In a large bowl, toss together all of the salad ingredients. Can be served room temperature or chilled. On each plate, add a large handful of washed organic spinach. Spoon salad mixture over the spinach and drizzle with dressing, then serve.